Amy, thanks for doing a great job walking our dog Indy for the last two weeks. It was short notice but you handled everything very well, we were able to relax knowing Indy was in good hands and the daily updates were appreciated. You provided a professional, reliable and caring service and I feel we were lucky to get you at our first attempt. Mr Stewart : Mevagissey : 25 August 2014 : Pet Name: Indy. Amy has looked after our two cats, Molly and Ella, several times now and we have always been very satisfied with her visits and the welcome text messages that we receive reassuring us that they are both okay. On the most recent booking she excelled herself as we had forgotten to leave the front door key out for her. Fortunately we were only away for one night but she made a special visit to Asda to buy our cats' favourite pouches and then managed to put them in through the cat door (which is electronic and only responds to the cats' chips) when Ella emerged to say hello. I cannot recommend her too highly. Mrs Williams : St Austell : 18 August 2014 : Pet Name: Molly and Ella. Hi Amy, just wanted to say thanks for looking after Molly so well when we were on holiday and taking her for some great walks. We have seen her pictures on facebook with her doggy friends and she looks like she is having a great time. We have told lots of people about you and how wonderful you are, and I think one of my mums friends have already been in touch. It was lovely knowing on holiday that we could relax and not worry about her walks as we would have had to ask friends / neighbours but for 2 and half weeks its a bit much to ask, and also my mum has to be in to let them into the house etc. So all the best and we will certainly be in touch again next time we go away. Molly says thanks. Debbie, Derek, Barbara and Molly. Mrs Stewart : St Austell : 24 May 2014 : Pet Name: Molly. Mr Bowe : Roche : 04 May 2014 : Pet Name: Buster. 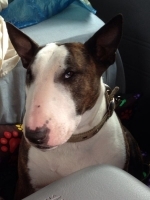 Mrs Rodda : St Austell : 14 April 2014 : Pet Name: Bruce. Although Eden allows dogs in the gardens we did not like the thought of leaving him in the car while we visited the biomes - it was his holiday too! Amy could not have been more helpful, advising us the best time to visit, where to park etc. Then off noodles went without even a glance back. Amy showed us lots of photos of their adventures and his new friends. The best sign that he had a good day ... he was asleep in the car before the first roundabout on the way home. Thank you! Miss Garner : Mevagissey : 09 April 2014 : Pet Name: Noodle. Amy has been walking Louie for 2 days a week for over 2 months now and helping with his dislike of other dogs. He has improved so much. I really appreciate having a text saying how the walk has gone really puts my mind at ease. 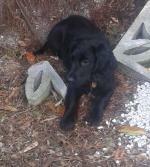 Ms Sleeman : St Austell : 22 February 2014 : Pet Name: Loiue. We were visiting St.Austell on holiday with our dog Charlie and had a special event to attend on one of the evenings of our stay. Amy was an absolute star and stepped in at the last minute to provide care for Charlie while we were out, meaning that we could enjoy our evening in the reassurance that he was being well-looked after. Despite asking for unconventional hours, Amy was more than accommodating and really put our minds at ease. Charlie loved playing with Echo too! Miss O\'Connor : St Austell : 23 November 2013 : Pet Name: Charlie-Barkin. Mr Smith : Gorran : 20 November 2013 : Pet Name: Lupin & Flea. I cannot praise Amy enough, she runs a professional company and best of all Barnaby likes her. Barnaby is a shy dog so when Amy first met Barnaby she took it slow gaining his confidence. He hated going in a car but with Army's patience and perseverance things are slowly improving with Barnaby seeming eager to get into her transport and enjoy the companionship of the other dogs Amy looks after and of course there is the walk, training and exercise for him to enjoy. I can only say I wish our paths had crossed long ago and our other dogs would have enjoyed her friendly professional service. Mr Moss : Bugle : 15 November 2013 : Pet Name: Barnaby.